Jusepe de Ribera left his native Spain for Italy as a young man. He is recorded living in Rome by 1612, one of many talented young artists who were held in thrall by Caravaggio’s revolutionary paintings. Ribera’s considerable talents caught the eye of both his fellow painters and well-connected patrons, and in 1616 he settled into a highly productive career in Naples. Ribera was soon employed by the Spanish viceroys who governed Naples, and also enjoyed the patronage of the most important religious houses. 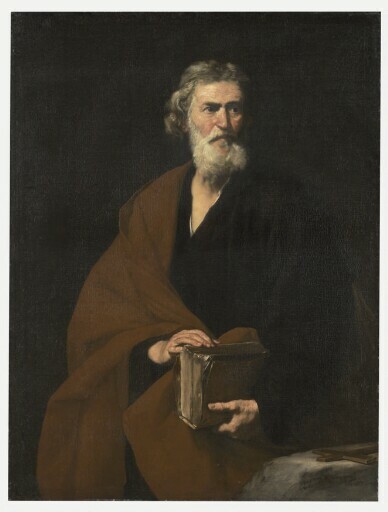 In this devotional painting, Ribera has created a deeply affecting image that conveys the semblance both of a living being and of an apostle who knew the Lord and his Word. Although the identity of the saint is not certain, the book he holds accounts for his traditional identification as Matthew, author of the gospel. This painting originally formed part of an Apostolado, or series of portraitlike images of Christ’s apostles. Here the influence of Caravaggio––the stark placement of the intensely lit figure against a dark background, the unrelenting naturalism, and the strength of characterization––is tempered by a classicism that reveals Ribera’s study of the Renaissance masters and contemporary Bolognese painters. purchased for £99-15 by (Max Rothschild, London). (Charles Sedelmeyer, Paris, by 1925, as “St. Paul”). purchased by Kimbell Art Foundation, Fort Worth, 1966.